I can’t wait to be back in Brazil! The audiences are always wild which makes it very special for us. We’ve freshened up the show since our last visit and we are excited to be playing some of our new songs from the new album as well as the songs we always love to play. We want to see you, we want to rock out and party with you again! For the ninth time Paul McCartney is among us. And it does not matter if the more than 45,000 fans who packed Allianz Park tonight have already attended several of their shows. Going to an ex-beatle performance is almost like going to a Roberto Carlos show. You know what’s going to happen, you know all the songs, but you still get emotional with each of them as if it’s the first time…. […] In Sao Paulo since Sunday, Paul McCartney enjoyed the Sao Paulo capital before the show as a legitimate São Paulo. As he has done since 2010, he returned to cycling, this time in the People’s Park with his wife Nancy Shevell. Except for the arresting security guards, he circled quietly among the people. At the stadium, he made a point of showing that he was practically a Brazilian. 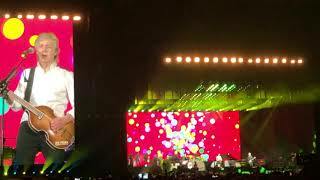 To the country, the former Beatle dedicated the song “Back in Brazil” composed in homage to Brazil and that had a video clip recorded in Salvador, Bahia. “This song I did in honor of Brazil,” he said in Portuguese. The audience responded by dropping green and yellow balloons…. This was the 4th concert played at Allianz Parque.